Always Clean Australia works for you; to protect your health and property. 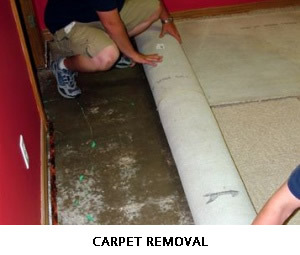 Extraction of excess water should begin immediately and the carpet should be completely dry within 12 hours following intervention. Failure to follow these recommendations may allow for the development of several types of bacteria and fungi that may negatively affect human health. With our powerful machinery and high suction and in extreme cases, air blowers will be applied for a quicker drying process. 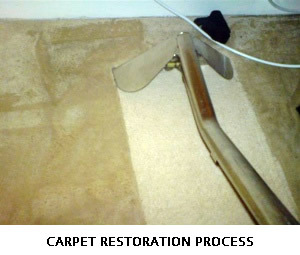 Carpet will be cleaned after drying in case of bacteria which might have set inside the fibre. Emergency flood extraction is a 24 hour service. Preventing mould is one of many concerns for those who have suffered from the occurrence of water damage. There are misconceptions about water damage and the potential for mould growth. Water damage mitigation is something that must be dealt with quickly and effectively. Most insurance policies not only cover the cost of water damage mitigation, but also require the policyholder to take the necessary steps to prevent secondary damages. Water damage mitigation is a specialized field that requires specialized equipment and know-how. Experienced companies, such as Always Clean Australia provide restoration services that protect the building structure you and your employee’s health. Water damage can be the starting point for many serious problems that can affect a building, damage personal property and present serious health risks to occupants. To restore property and protect health, a professional restoration contractor must be employed to carefully manage the project. Our job is to stop bacteria from spreading, prevent mould growth, secondary damage and saving the structure and its many contents. Additionally, we must communicate to you, our client and insurance company representatives with confidence and authority. Poor indoor ventilation can also cause moulds to thrive. Wet building materials and humid indoor creates mould as does poor ventilation. It is important to dry water damaged areas and items within 24-48 hours to prevent mould growth. The most effective way to prevent mould growth on water damage losses is to begin the drying process quickly. If areas of moisture are overlooked, moulds and bacteria can grow. To protect your property and health, all of the moisture must be found and dealt with immediately. Sometimes water flows down the inside of wall cavities. Other times standing water will wick up a wall. Unless water stains appear this moisture could go undetected until moulds and odour problems occur. 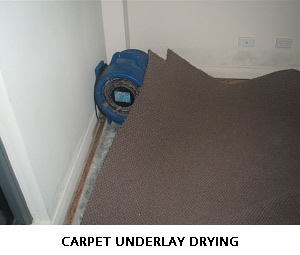 Water damage restoration is more than drying wet carpets. Category 1 or clean water is that in which the source of the water is from a clean water source such as a plumbing supply line. Category 2 or grey water damage is that in which the source of the water may contain chemicals or other contaminates that could cause discomfort or sickness to the occupants. Some examples of this would be an appliance discharge, a broken waterbed or fish tank or overflows from toilet bowls. Category 3 or Black water contains pathogenic agents and is grossly unsanitary. Examples include Toilet backflow that originate from beyond the toilet trap, flooding from seawater, ground surface water or rising water from rivers and streams. Category 2 water that is not removed promptly, may be re-classified as category 3 water. During sewage backups or other “black water loss”, large amounts of bacteria can enter the interior environment and pose potentially serious health risks to the occupants. In fact, the bacteria introduced to the structure could stay active for up to one month if left untreated. Advanced restoration methods are employed to rid the structure of all traces of sewage and make the structure clean and safe for occupancy. In a black water loss, care must be taken to not disturb the bacteria in the water and make it airborne. When bacteria are contained in the water and not sent airborne, it is not easily breathable by restoration workers or occupants. This means that doors and windows should remain closed during clean up. The typical fans and blowers used to dry a structure that has experienced a “clean water loss” (non-sewage) should not be used in the early stages of a sewage clean-up project. 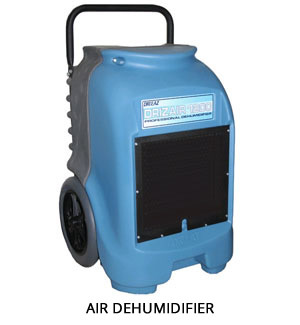 Negative air machines, equipped with HEPA filtration, are utilized to remove bacteria and other contaminants from the air during restoration work. Standing water and bulk sewage must be extracted with self-contained vacuum equipment with proper waste holding tanks. The waste is then disposed of at a sanitation station or, authorized dumping facility. Hard surfaces that are impacted must be cleaned and sanitized. Soft structural materials such as carpeting, carpet paddings, and plaster wallboard must be removed and properly disposed of. Any material that absorbs substantial amounts of moisture and cannot be adequately cleaned must be removed. Once contaminated materials have been removed a second application of sanitizers must be applied to all work surfaces. Eliminate the source of water if possible, or contact appropriate parties to eliminate the water source or to make necessary repairs. Keep any parts that are replaced for your insurance company inspection. If there is no risk of electrical shock, turn off circuit breakers supplying electricity to wet areas; unplug and remove any small electrical devices currently located on wet floor coverings or other wet surfaces. Remove and secure small furniture items to minimize rust or other stains and expedite restoration. Place aluminium foil under legs of wood furniture, especially antiques that may permanently stain carpet. Hang draperies and pin up furniture skirts as possible to prevent contact with wet floor coverings, minimizing damage such as water marks, browning, dye transfer or migration. Make plans for restoration crews to remove large furniture items from affected areas. Don’t forget the china cabinet, entertainment centre, waterbeds or aquariums! Be aware that time is a crucial factor, and delays in loss mitigation and restoration may result in adverse health and safety effects and additional damage to the structure and contents. Turn off the HVAC or air handling system if safely accessible. Protect yourself against contact with sewage or sewage-contaminated items. Wear gloves, boots, goggles, protective clothing and a respirator if you absolutely have to perform any cleaning or handling of sewage-contaminated items. Wash your hands after handling any sewage-contaminated items. Contact your doctor if you have any adverse health effects. Do not use your home vacuum (wet/dry vacuum) since electrical shock may result, as well as damage to the equipment itself. Place newspaper on wet surfaces since newspaper ink transfers easily. Walk on wet surfaces any more than necessary in order to minimize safety hazards and to keep from spreading damage and possible contaminants. Do not adjust indoor air temperatures unless instructed by a qualified restoration technician. Do not enter an area that has standing water because of the potential for electrical shock hazards. Do not consume any food that has been left out in a contaminated environment. Use personal hygiene items that have been left out in a contaminated environment. Turn on fans to dry things out. Have respiratory problems, including allergies and asthma. You are under the age of 2 or over the age of 60. Have a weakened immune system because of illness, medication or any other reason. As you can see, there is much more to water damage restoration than is often imagined. When water damage strikes, most persons are concerned with the wet carpets, which are usually a soggy mess. An experienced restoration contractor has many other concerns. After all, he knows anyone can rent or buy fans to dry a wet carpet. In fact, in recent years, carpet and carpet cushion have been designed and manufactured to withstand water. Using special microscopic textures on carpet fibre, many carpets are made to prevent moulds from growing. Today, with the widespread use of drywall vs. plaster, engineered wood products vs. wood, and the use of vinyl wall-coverings, moisture can become trapped and provide the needed environment for mould growth. 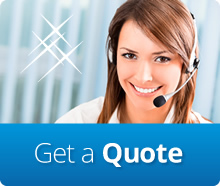 If you currently have an emergency situation, call us on 1300 654 317 and we will dispatch a crew to your location. Do you require Emergency Flood Damage?